Per usual we came for dessert, but as soon as you walk in the front doors we were not able to focus on the desserts because of the great sizzling smell of meat surrounding us. The restaurant has amber tones with a laid back vibe while maintaining some elegance. Guests are able to see Knife’s dry aged meat through a glass window near the entry way and while they dine they can watch the cooks work at their finest with its open kitchen. Overall a very inviting environment to enjoy your cut of meat and after dinner desserts. Years ago I had the opportunity to meet Chef John Tesar at his seafood restaurant, Spoon. It was right after he was on the television show, Top Chef, and I had become a fan of his – one, because of the show and two, because Chef Doug Taylor from Mario Batali’s Las Vegas restaurants told me I should follow Chef Tesar’s work. 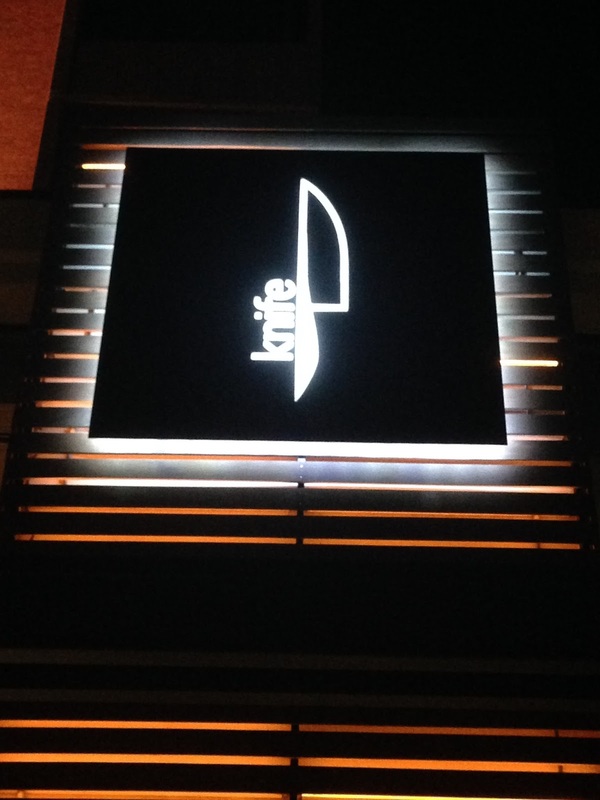 Sadly I was never able to dine at Spoon, but I am now happy to say I have been able to eat at his newest adventure, Knife. 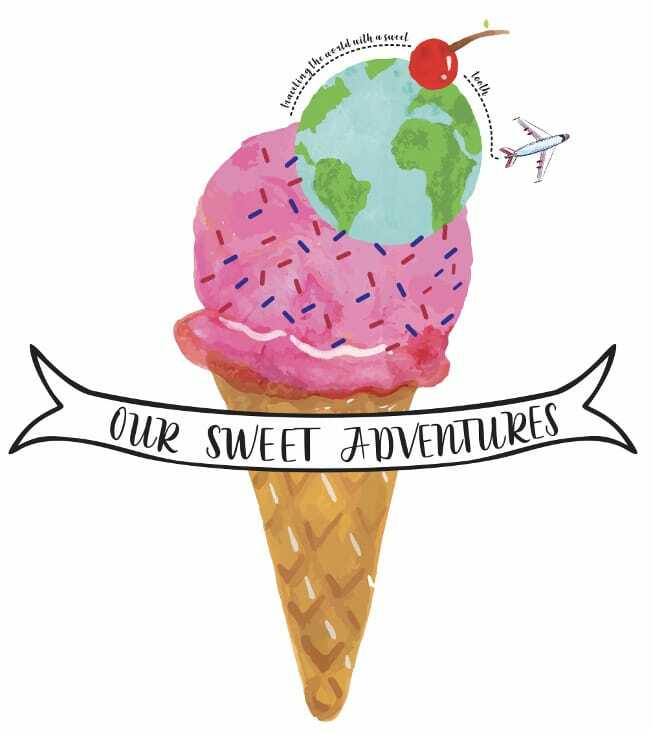 The pastry chef, David Collier, is an award winning chef and known as one of Dallas’ best pastry chefs in the city. Chef Collier has been working alongside Chef Tesar since The Mansion, Spoon and now Knife. Quite the duo these two. Chef Collier delivers creative desserts using modern techniques and plating. This dessert was a great way to finish the summer! 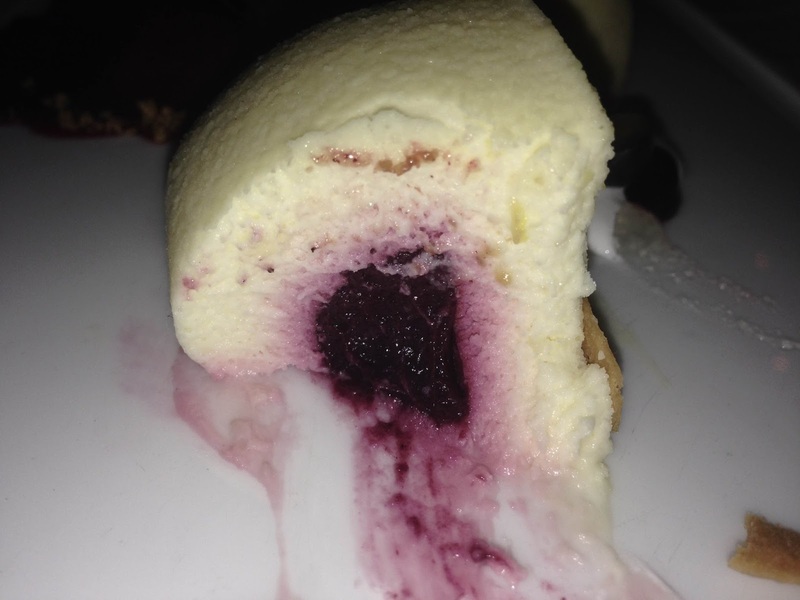 Great presentation – lemon mousse with a blueberry cremeux filling, lemon curd, fresh blueberries, crisp thin cookie, and blueberry sorbet. The sorbet tasted like fresh blueberries, purely natural and sweet with a great mouthful – not icy at all. Lemon curd drizzled throughout the plate was good, but had a sharp tartness. 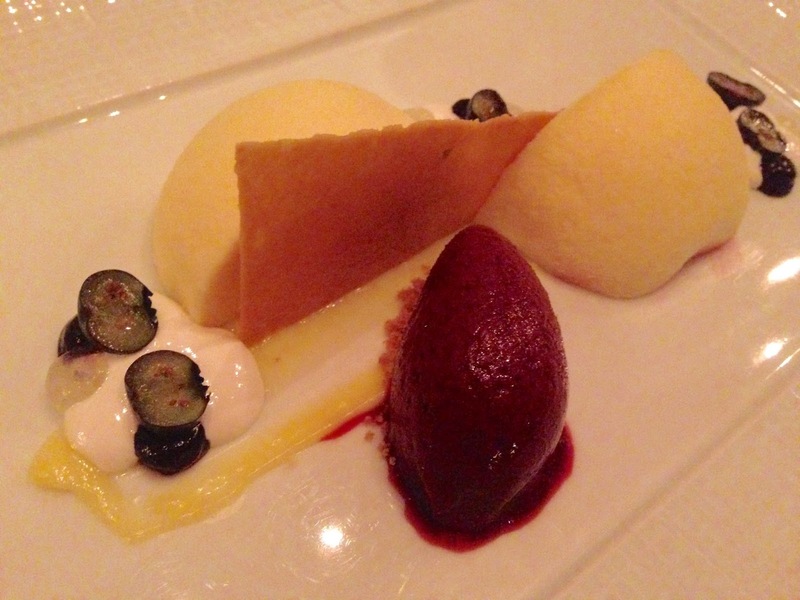 Lemon mousse was silky smooth and extremely soft – so light that it was airy. It was also tart, but the sweetness from the blueberry cremeux and the mousse being on the lighter side it played out pleasantly. All around this dessert is very tart and with the help of the fresh blueberries and blueberry sorbet they definitely cut the tartness out and balance the plate fairly well. Had their been more blueberry components or rather than the tartness from the lemon components this dessert would have been a perfect ten. A triple chocolate layered cake with chocolate mousse. This cake as a whole has to be huge, I mean just look at the length of that one piece of cake – it almost covers the plate! The end of the cake has a quenelle of dulcey ice cream, dehydrated chocolate mousse and dulcey mousse. The chocolate layered cake was so rich and amazing. The cake was dark chocolate – both dense and spongy whereas the chocolate mousse was soft and smooth. What was left of the dulcey ice cream was delicious. Dulcey is essentially cooked white chocolate and in both the dulcey mousse and ice cream the flavor of dulcey is present – a toasty caramelization finished with a buttery sweetness which helps cut the richness of the cake. Lastly there is the dehydrated chocolate mousse which was more cakey than anticipated and added a different, unique texture to the table. All around this dessert has great chocolate tones. 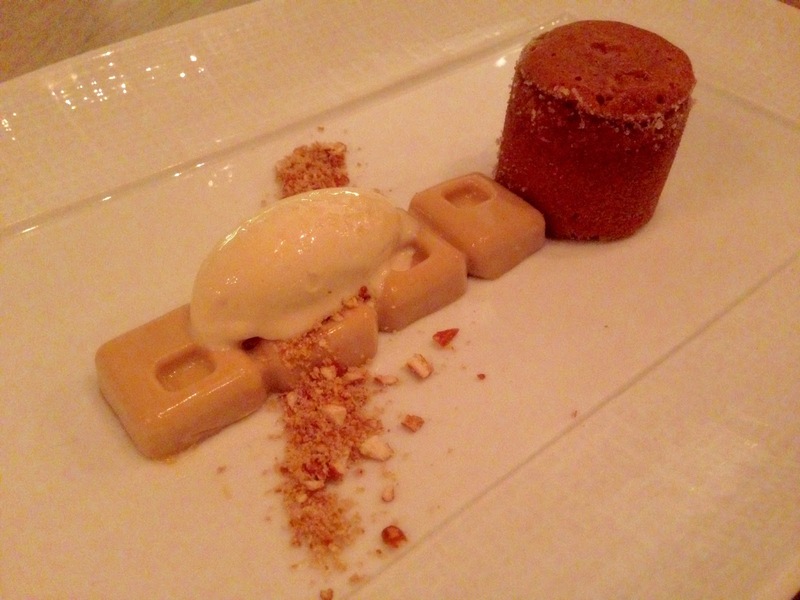 Dulcey panna cotta, caramel cake, some pretzel pieces and ice cream. Wow what a fun, playful dessert! The dulcey panna cotta is sweet and velvety – basically melts in your mouth. The caramel cake has a warm liquid center that flows just a little bit – not as much as a molten cake, but enough to enjoy. Besides being rich in sweetness it was also quite salty that the taste buds get a kick right as it hits the lips. The salted pretzel pieces brings a pop of flavor with its saltiness and a welcoming crunchy texture. The pretzel ice cream is fantastic and literally tastes like a salted pretzel stick – yes a pretzel stick not one of those soft pretzels from the fair or Auntie Anne’s. Overall beautiful contrast of warm and cold and extremely rich and salty, but in a beautiful way! Easily a favorite hands down. 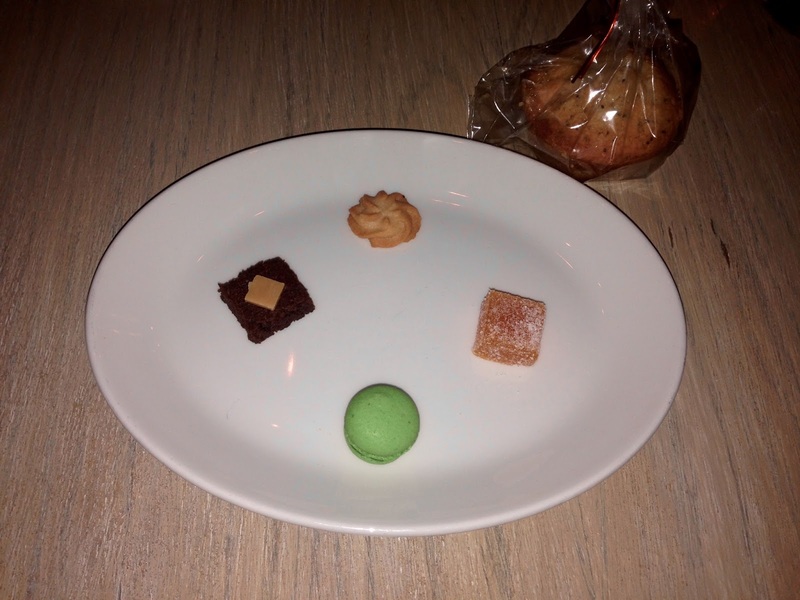 Nice gesture to give guests complimentary desserts after their dinner – I think it helps lessen the blow of the check. Knife’s complimentary desserts are very simple, in the past we have received a more elegant presentation, but all things being said these are free and are taken with gratitude. First of all I am not a fan of macaroons I understand that its a trend and everyones muse, but I do not care for them. With that being said I would eat this particular macaroon everyday. Perfect balance between tart and sweet. The lime was very present and showcased well along with some strawberry notes. A grown ups version of a gummy bear. Acidic in the beginning and then very very sweet in the end. Very light in hazelnut. Crunchy and all around a delightful cookie. Excellent! 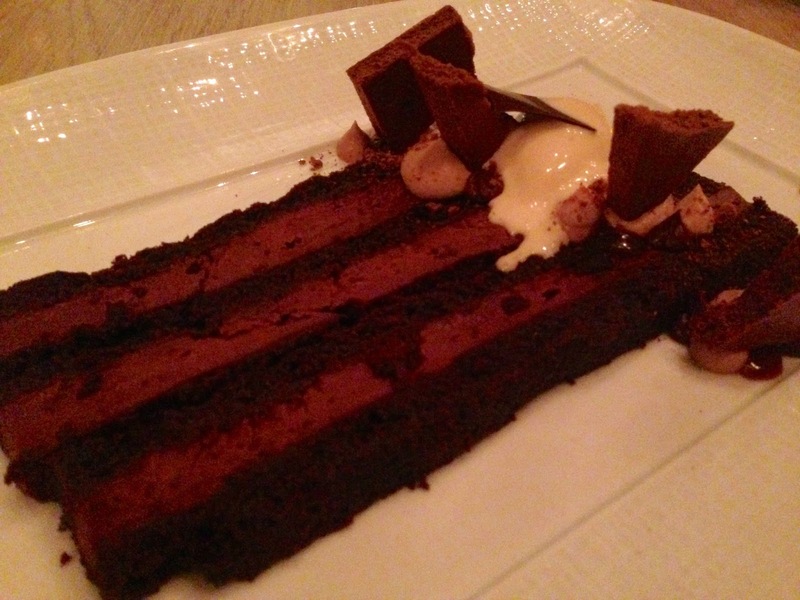 Rich dark chocolate cake with a salty finish from the fleur de sel. Ducley square on top of the cake giving a nice hint of caramel sweetness. Crunchy on top and spongy inside. Great texture and flavor – the lemon essence is outstanding. Sweet till the very end. Pure excellence for something so simple and free!